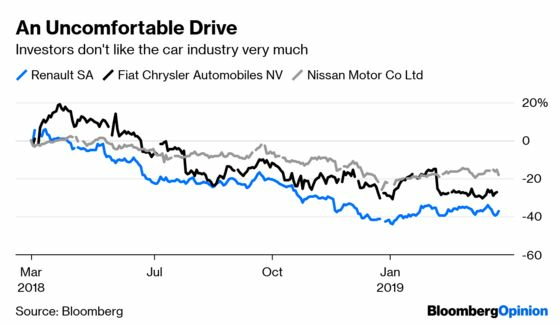 (Bloomberg Opinion) -- In view of the bad feeling unleashed by Japan’s detention of Carlos Ghosn in November, one might have expected Renault SA to keep things quiet for a while. Ghosn was head of the giant Renault-Nissan carmaking alliance and one theory for his downfall was that he was pushing too hard for a full combination of the French and Japanese companies. But now, according to the Financial Times, Renault SA hopes to restart those merger talks with Nissan Motor Co within 12 months and then launch a bid for another big carmaker, possibly Fiat Chrysler Automobiles NV. This is surprising, to put it mildly. Seeking fresh discussions about a tie-up risks opening barely healed wounds in Tokyo. That Renault would even consider such a move suggests relations with Nissan have improved since Ghosn was ousted. But even more than that, it underscores the desperation of carmakers as they try to respond to the industry’s epochal challenge: the hugely expensive shift to electric and automated vehicles. The history of automotive M&A hasn’t been a happy one; Daimler’s takeover of Chrysler is but one of many failed marriages. So it’s remarkable how lively the carmaker courtship rumor mill has been lately. Peugeot SA has reportedly approached Fiat; Volkswagen AG and Ford Motor Co. are trying to deepen a nascent partnership; and fierce rivals Daimler AG and BMW AG are teaming up in autonomous driving and car sharing. Elsewhere, Jaguar Land Rover’s heavy losses might put it in play, Daimler may sell a stake in its loss-making Smart unit, and the FT says Ghosn courted Fiat when he was still Renault boss. One word explains all this frantic positioning: scale. The more electric cars a manufacturer can produce, the less burdensome the investments in new technology and plants. The same goes for software, which will become even more pivotal (and costly) once cars drive themselves. It’s in the interest of both Nissan and Renault, then, to maintain their 20-year old cost-sharing alliance. Unpicking it would be hugely expensive, especially now that key markets like China and the U.S. are slowing down. But a full-blown merger is something else entirely. Surely they have enough problems to manage without attempting that. The immediate priority is embedding a new governance system at Nissan and the alliance, to replace the dominance of Ghosn. His departure helps, but the French and Japanese sides still have a long way to go to restore trust. In fairness, the alliance now has a new boss, the understated Renault chairman Jean-Dominique Senard, who brings a more placatory approach. Nissan may be open to renegotiating the alliance’s capital structure if Senard proves reliable, the FT reported, citing people close to the Japanese group. But this is almost certain to be a fraught endeavor, regardless of the personalities at the top. Unpicking a clearly unbalanced cross-shareholding structure (Renault holds 43 per cent of Nissan, whereas the more profitable Nissan owns 15 percent of Renault) is a delicate enough task in view of the French state’s stake in Renault. Trying to then agree merger terms that both parties consider fair would be harder still. If you take away its holding in Nissan, the stock market ascribes little value to Renault’s own carmaking operations. Meanwhile, these deliberations would be taking place at the same time as Ghosn’s trial, which will no doubt be a huge distraction for both companies in the coming months. And what of Fiat? Its U.S. trucks and SUV profits are attractive, but does the Renault-Nissan alliance (which includes Mitsubishi Motors Corp.) really need to get any bigger? It already sells more than 10 million cars a year. That’s on a par with industry giants Volkswagen and Toyota Motor Corp. If you think the politics of Nissan and Renault are thorny, just try to add Fiat Chrysler’s Italian and American mix. Another French carmaker, the less geographically diverse Peugeot, is more in need of an international dance partner like Fiat. France also owns a stake in Peugeot. There’s also the problem of job cuts at a time of rising populism. It only makes sense for automakers to consolidate if they’re willing to close excess capacity and share resources. Merge or not, the car industry will probably shed thousands of jobs over the next decade: Building an electric car is about 30 percent less labor-intensive than a combustion engine model. As such, you can see why companies will consider even the most impossible-looking deals. That doesn’t mean they can be done.